Established by Planet Ark in association with the NSW Department of Environment Climate Change and Water and Pitney Bowes, Business Recycling contains Australia-wide listings of re-use and recycling collection and drop off collection locations for more than 100 different materials in one easy to access site. The website and supporting hotline (1300 763 768) is designed to make it easy for businesses, especially small and medium businesses, to find recycling services in their area. And with recycling fast becoming the most cost effective waste solution for business, the website can also save businesses money. From construction and demolition to restaurant, retail, electronic, paper and plastic waste, BusinessRecycling will be a one-stop shop of Australia's recycling service providers. "Our research shows most businesses have actively looked into and implemented strategies aimed at reducing their impact on the environment," says Planet Ark's Campaign's Manager Brad Gray. "Before Business Recycling, there was no easy way to find relevant recycling services. Now, the difficult task of searching is done and businesses can easily find the solutions they need." The Site was launched at NSW Parliament House on 24th June, 2010. 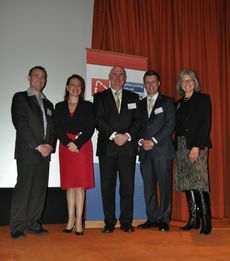 Event speakers, from left to right: Brad Gray, Planet Ark; Angela D’Amore, NSW Parliamentary Secretary for the Environment: Tony Simonson, Pitney Bowes; Jamie Batterson, Transpacific Industries; and Rebecca Gilling, Planet Ark.